The idea of “locally-inspired German fine dining” reads like an oxymoron of sorts—a weird interplay of German food in Indiana existing in the realm of fine dining—but Liter House has found its niche in this tongue-tied conception of Hoosier-inspired Bavarian cuisine. From sauerkraut balls to the pork schnitzel, Liter House is delivering creative and downright delicious food in a way that feels both honest in its approach and exciting in its ambition. Get the pork schnitzel. Breaded and deep fried, it is impossibly tender with a gorgeous golden, earth-shatteringly crisp exterior. Currywurst is served over feta fries, mint, tzatziki, and baba ganoush is unexpectedly wonderful and incredibly delicious. 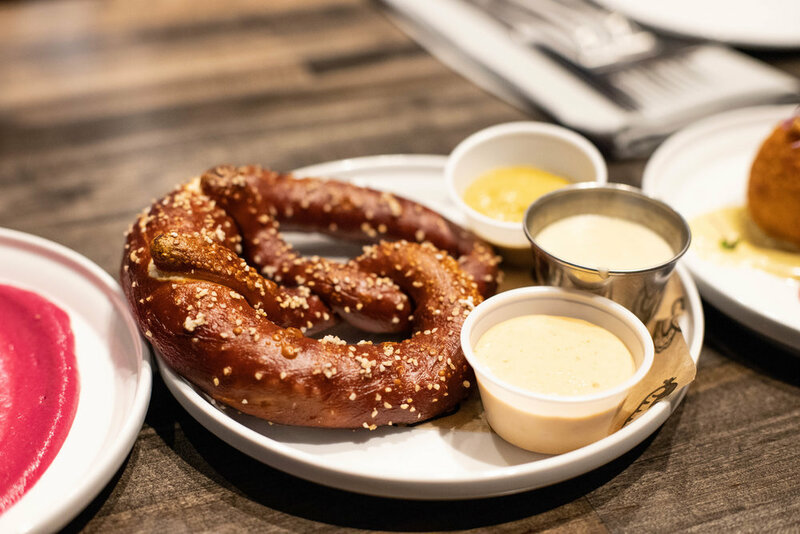 Get your Bavarian culinary journey started with some pretzels and spicy beer mustard. You won’t regret it. Liter house is doing some really cool events, including their monthly dinner series featuring specially curated menus and beer pairings.